Working outdoors, especially in the winter, makes your hands vulnerable not only to standard hazards, but cold as well. The Hotteeze Hand Warmer (Pack of 10) is the simple, fast-acting and lasting solution to cold hands. Placed inside your usual work gloves, it can keep your hands warm for up to 10 hours. 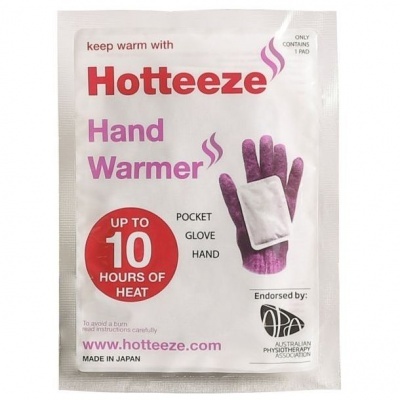 This purchase includes a pack of 10 hand warmers; the Hotteeze Hand Warmer is also available in individual pads for greater convenience. Because the Hotteeze can be applied rapidly, generates heat quickly and fits easily into a hand or glove, it is ideal for those who spend a lot of time working outdoors or in cold environments, such as cold rooms, or a warehouse. You can easily place it inside your work gloves and enjoy both the protection of the gloves and the warming effect of the Hotteeze.